Milk and Cookies —Sound like fun? Our Our Time curriculum packs more fun and learning into one class than any other music and early childhood development program – plus you get a fully interactive set of class materials that research has proven to help your toddler develop lasting learning skills. That’s why Kindermusik is the best value per class! Special moments at home like the aroma of baking cookies, the coziness of the family kitchen, the chatter among family members and the anticipation and excitement of having friends come to visit all come to life in Milk and Cookies. 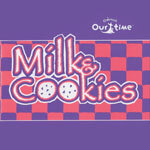 Milk & Cookies songs and activities promote interaction between parent and child where the parent gently guides their child’s learning all while playing together. All activities are carefully arranged to maximize your child’s growth and development in all 6 regions of the brain: Physical, Cognitive, Social, Emotional, Language, & Music. Fiddle-dee-dee — Creatures of the animal kingdom, whether furry, web-footed, hoofed, winged or whiskered, are the subject matter for Fiddle-dee-dee. Animal sounds and movements, which are so appealing to children, naturally prompt imitation and provide abundant opportunity for active listening and vocal play. Our animal theme promotes interaction between parent and child and all activities are carefully designed to maximize your child’s brain growth and development. The 2 At Home CDs emphasize the string instrument family including the mandolin, banjo, classical and folk guitar and harp. Join in on the music making with your own instrument, a pair of Fiddlesticks! 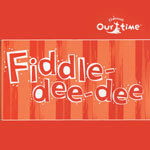 Sporting the bright stripes of a bumblebee, Fiddlesticks are a one-of-a-kind Kindermusik instrument that can be rattled, rolled, tapped, and fiddled with in endless possibilities to create fun sounds and rhythms. Also included are two illustrated Story Books and a Home Activity Book all packaged in the adorable Dog House Carry & Play.